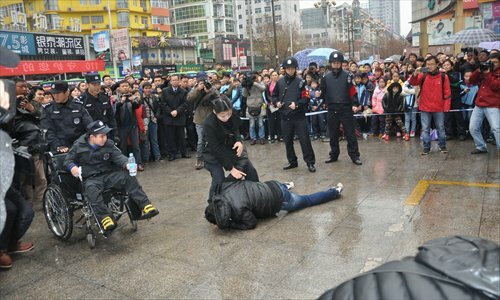 In order to fulfill a 9-year-old disabled schoolboy's dream of being a police officer, local police and residents in Xinyu, Jiangxi Province, simulated a hostage situation on Saturday. The boy, Zou Junyi, was awarded the medal "brave little police officer" by Xinyu Mayor Cong Wenjing at the scene. Zou suffers from muscular dystrophy, with the symptoms presenting since he was 6 years old. He lost the ability to walk in December, Zou's mother, Chen Qingmei, told the Global Times, adding that her family has spent about 500,000 yuan to treat the disease and can not spend any more. "Our family was touched. These special experiences can help my son build his confidence to fight the disease and overcome difficulties," Chen said. Ao learned about the boy's dream when he visited him in December, and decided then that he wanted to find a way to help. The drill was inspired by a US case in which 7,000 people in San Francisco, including the city mayor, helped 5-year-old leukemia patient Miles Scott make his wish - Batkid saves city - come true in November, according to Ao. The idea was backed by local police who arranged for about 10 police to attend the exercise. The local government employed the "robbers" on Wednesday after about 209 residents submitted applications, he said. "We planned the activities to encourage people to care for others. The drill is a perfect case of combining a police drill with philanthropy," Ao said. "It also shows that our government is willing to integrate itself into residents' lives to make ties with them closer." Zhu Lijia, a public management professor at the Chinese Academy of Governance, told the Global Times that the robbery drill was ridiculous. "No one has the obligation to help him to realize his dream. If he wants to go to outer space, will we help him do that?" "It harms fairness when public resources are used to serve one individual and fulfill his dream," Ding Zhaolin, an expert in public management, told China National Radio on Sunday.